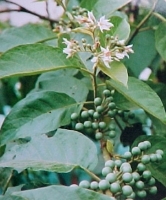 Peruvian Amazon picão preto is used for aftosa (foot-and-mouth disease), angina, diabetes, menstrual disorders, hepatitis, laryngitis, intestinal worms and for internal and external inflammations. In Piura region of Peru, a decoction of the roots is used for alcoholic hepatitis and worms. Jurubeba is listed as an official drug in the Brazilian Pharmacopoeia as a specific for anemia and liver disorders. 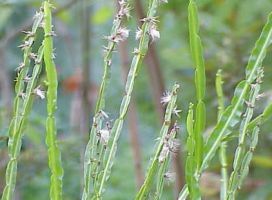 Jurubeba has long been used for liver and digestive disorders. 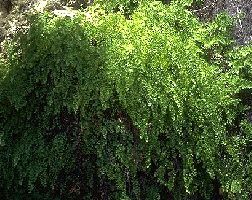 It is employed mainly today by Brazilian herbalists and practitioners as a stomach tonic; to stimulate the function of the gastrointestinal tract; for dyspepsia, allergies, asthma, and fevers; and for chronic liver problems. 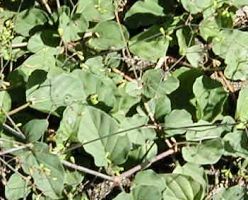 Gervâo is also used in Brazil as a diuretic for various urinary complaints and as a mild laxative for constipation. In many countries around the world, the fresh and/or dried leaves of fedegoso are crushed or brewed into a tea and applied externally for skin disorders, wounds, skin fungus, parasitic skin diseases, abscesses, and as a topical analgesic and antiinflammatory natural medicine. It is employed in Brazilian herbal medicine to stimulate the emptying of the gallbladder, as a diuretic, for all types of liver disorders (including jaundice and hepatitis), gallbladder pain and stones, urinary tract disorders, renal disorders, kidney stones, cystitis, and nephritis. In Ayurvedic herbal medicine systems in India, the roots are employed as a diuretic, digestive aid, laxative, and menstrual promoter and to treat gonorrhea, internal inflammation of all kinds, edema, jaundice, menstrual problems, anemia, and liver, gallbladder, and kidney disorders. It was named for its effective use to generations of Amazonian indigenous peoples in eliminating gallstones and kidney stones. 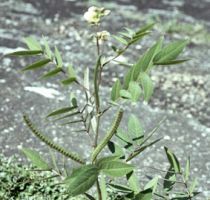 In Brazil, the plant is known as quebra-pedra or arranca-pedras (which also translates to “break-stone”). 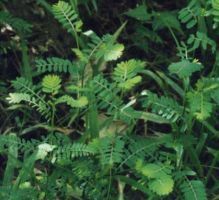 In addition to kidney stones, the plant is employed in the Amazon for numerous other conditions by the indigenous peoples, including colic, diabetes, malaria, dysentery, fever, flu, tumors, jaundice, vaginitis, gonorrhea, and dyspepsia. 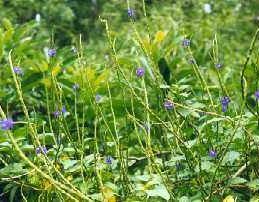 Based on its long documented history of use in the region, the plant is generally employed to reduce pain, expel intestinal gas, to stimulate and promote digestion, to expel worms, as a mild laxative. Other popular uses for carqueja in Brazilian herbal medicine today are to treat malaria, diabetes, stomach ulcers, sore throat and tonsillitis, angina, anemia, diarrhea, indigestion, hydropsy, urinary inflammation, kidney disorders, intestinal worms, leprosy, and poor blood circulation. 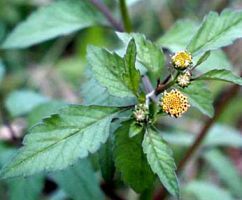 Used as an infusion or syrup and use it as a diuretic, as an expectorant and to calm coughs, to promote perspiration and menstruation, and to treat urinary disorders, colds, rheumatism, heartburn, gallstones, alopecia (hair loss), and sour stomach. 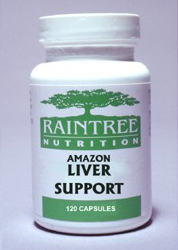 A combination of 8 rainforest botanicals traditionally used in South America to nutritionally support the liver. The information provided in this website is intended for educational and informational purposes only. It is NOT in any way, directly or indirectly, an advertisement or claim for any actual Raintree product, nor should it be construed as such. The products and various statements contained within this website have not been evaluated by the MOH, BMA or the FDA and, as such, these products are not intended to treat, cure, mitigate or prevent any disease or ailment. The references contained herein relate to local, indigenous and traditional uses only. Raintree Health categorically "does not" offer professional medical advice. We would always strongly advocate that our visitors seek advice from their own GP, private doctor or medical specialist for any ailment, illness or medical condition. You know it makes sense! Portions of this site are © Copyrighted 1996-2011 Raintree Nutrition, Inc.
Austin, Texas 78758. All rights reserved.